The Gunpowder River flow peaked late Friday night at 1,700 cubic feet per second at the Falls Road gauge and at over 2,600 cubic feet per second at the Glencoe Rd gauge. Recent heavy rainfall and a full reservoir resulted in spillover despite a release made by Baltimore City Friday afternoon. Flows are slowing dropping, and currently at 1,610 cubic feet per second at the latest 6:00 am gauge reading at Falls Rd. Generally flows on the Gunpowder are wadeable, but very challenging at or just over 300 Cfs, but higher flows present a real danger above that level. Anglers may not have opportunities to fish through this weekend, but can monitor flows to follow the status of the Gunpowder. This entry was posted in fishing report, video on August 29, 2009 by Jason du Pont. Backwater Angler T-Shirts in Stock! Backwater Angler has partnered with Mary K. Jenkins, aka. The Fish Lady, to bring you pre-shrunk, 100% cotton, T-Shirts now available in three styles. The short sleeved T-shirts feature a vibrant screen print high across the back, and the Backwater Angler logo printed on the right front chest. This entry was posted in gear, news on August 27, 2009 by Theaux Le Gardeur. 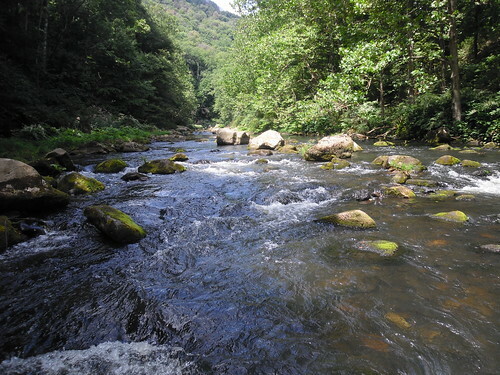 The Savage and North Branch of the Potomac rivers were at typical late Summer low flows while fishing last week, so these rougher rivers were much easier to wade. The North Branch flowing under 200 Cfs was at prime levels for nymphing the deeper slots where many fish concentrated and allowed sight fishing to big fish in shallow riffles. Hopper-dropper rigs were also a great way to fish these levels and effectively cover different types of water. Numerous miles were recently stocked with large rainbows in the 3-6 pound range, and some wild browns in the twenty inch range were visible in certain runs. The MD Fisheries biologists were conducting the electroshocking surveys on the Savage River in the mornings, but flows rose and leveled out in the afternoon at 60 Cfs. Blue quills, caddis and midges brought fish to the surface sporadically during the day, but by evening trout were rising in the flat water pools. A highly successful tactic was highsticking the rough pocket water with big dries on long 6x leaders, which amounted to 10-12 fish to the net over a few hours of fishing in the afternoon. Numerous trout quickly erupted on dries in the pocket water, so missing a number of fish was common. The selective feeders in the pools were challenging midday, but the bright sun didn’t prevent the opportunistic fish in the swift water areas from rising. The flat water trout were more aggressively taking flies sized 22-26 toward the last half hour before dark each night. On my last day I caught a dozen trout and got the Savage Slam; eleven inch Rainbow and Brook trout, and a seventeen inch Brown. The latest video includes a huge, rising brown trout feeding on tiny spinners at Noon on the Savage river, a mix of wild fish caught on the Savage, and heavy rainbows on the North Branch. This entry was posted in fishing report, video on August 26, 2009 by Jason du Pont. Thanks to Mike for stopping in the shop to cast some bamboo! Thanks for the advice on the Gunpowder a couple of days ago when I stopped in the shop to pick up a few things, and for letting me test-cast the Payne 97 clone by Bill Felter. A very nice rod! Could you put me on the email list for monthly stream reports, etc. ? Thanks, and I hope to be up your way again soon. Mike’s on the list, If you’d like to sign up for BACKWATERANGLER.COM’s monthly email newsletter please drop us a line at info@backwaterangler.com. This entry was posted in news on August 26, 2009 by Theaux Le Gardeur. Thanks to Max Green for the Delaware river fishing report and the kind words! As you so wisely eluded, fly fishing the Upper Delaware can be electric! “Similar to fishing some of the notable waters in Montana.” I concur. I spent two days fishing the upper west branch and main stem and was extremely impressed with the quality of fly fishing opportunities for large wild browns and rainbows. I stayed at the West Branch Anglers Resort. The accommodations and service were excellent. As you know, guide service is available through the resort but I hired Joe Demalderis, a 17 plus year Delaware Veteran who came highly recommended and proved to be exceptionally good. On the first day we floated the upper section of the West Branch and on the second day, we floated the lower quarter of the West Branch and 4 plus miles of the Main Branch. The gauge height at Hale Eddy was high at 5.10 feet, water temps hovered around 60 degrees F, and the combined flow rate from the Cannonsville Dam Discharge and recent precipitation was an unseasonably fast 2500cfs, spring-like conditions. We fished streamers exclusively with sink tip lines on the first day, casting to undercut banks and visible cover. The browns were extremely aggressive in some cases chasing 15 plus feet before putting the hammer down. Alewife or “Sawbelly” streamer patterns proved most effective which makes sense given the number of Alewives that spill over the dam during high water periods. 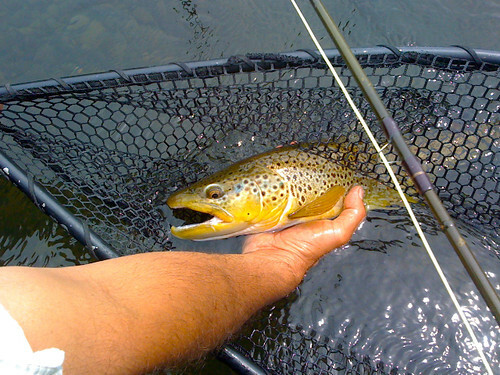 We caught and released 3 beautiful wild browns over 20″, the largest pushing 24″. I certainly lost my share as well. So goes the novice. We saw an occasional sulfur and a few Blue winged Olives 20’s but no real surface activity to note. The second day proved to be more challenging, but equally rewarding. We started the day off fishing, yep you guessed it, streamers! And after an hour without a single follow, we switched to Isonychia Dry/Baetis Nymph, Large Brown Stone Nymph/Baetis Nymph tandem systems which produced nicely most of the day into the early evening. The browns ranged from a very healthy 15″ to 19″, but the highlight of the second day was a 21″ rainbow, which we hooked with a dry fly on the last cast of the day just as the sun was setting while slow drifted through long, quarter plus mile pools casting to rising fish. Also, I wanted to say thanks for the many years of good advice and service. Your expert knowledge, experience, and good heartedness are much appreciated. The Simms G3 wader and Cloudveil boot system was the right call. Very pleased, and btw I sent my old waders to recycledwaders.com I am going with the wallet and nook sack. Great Idea! This entry was posted in fishing report on August 26, 2009 by Theaux Le Gardeur. 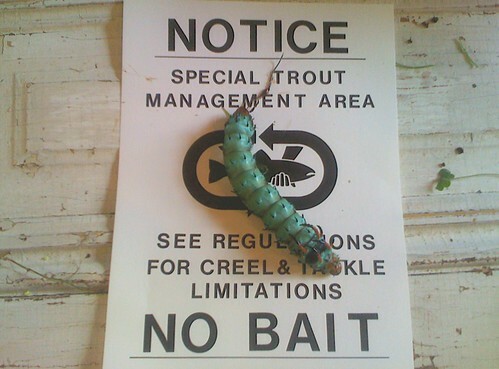 Harry just rescued a Hickory Horned Devil caterpillar from the icy cold depths of the Gunpowder river. Once returned, the caterpillar will grow to about 14.5 cm and eventually turn into a Regal moth, aka the Royal Walnut moth. We’re fast at work at the vise trying to find proper chenille and materials to imitate this beast-Stay tuned! If you’re lucky enough to spot one of these creatures chewing merrily away on the Walnuts and Hickories along the river please don’t disturb it. Today, the Gunpowder river is flowing at 32 Cfs, is low, clear and 56 F. Dry fly fisherman rejoice! Dave Smith called to report that it was “raining flying ants” above Falls Rd over the weekend. Tricos in the #24 range, and small Caddis have been accounting for a number of fish released in the catch and release section this week. Terrestrial fishing with small beetles and hoppers has also been very good-as long as one uses 7x. Hit the waters on Sat from Bunker Hill upstream. Was the only car in the lot when I started. Fished my way thru the campground hole and up and around the corner with nothing of note except a very brief trico flurry and a nice morning. However, tying on a caddis emerger was apparently the right move from that point on and yielded more than a couple fish. A good outing which drew to a close as the nice weather brought out a lot of folks enjoying the day and the water. Did stop by the shop on my way home to get a new pair of tying scissors and gave Max well wishes for his Cornell experience. Thanks again for your help today. I took your advice and fished below York Road. I hiked in about two miles and worked my way back. Fish seemed to be grouped together in pods in the bends of the river. To put it mildly, I was humbled. I did manage to catch two. My casting skills leave a lot to be desired. The only way I caught those two browns was by staging myself upstream of a pool and waiting for the fish to settle down and resume feeding. When they did, I would make a roll cast and try to set my drift up to hit their lane. I caught 11 chubs on green weenie variants. They weren’t trout, but a few of them actually had some size and fight to them. I fished the stretch above falls road from 4 till 7:30 and managed to hook five and land two. All in all it was a good day. Thanks again for your help. I’ll probably be back next Saturday. Please join us for a flyfishing school. On Sunday, August 30, a Backwater Angler Guide will be teaching a fly fishing school that is ideal for beginners. If you’re planning on flyfishing Maryland, or anywhere else for that matter, this course is a great introduction to the sport. The school covers knots, casting, gear, fly selection and an hour of on-stream instruction. Schools are held in a meadow overlooking the Gunpowder river by a Maryland state licensed and insured fishing guide. Class is held from 11:00 AM till 2:00 PM. Cost is $100 per person and includes the use of gear. A Maryland Non-tidal fishing license and trout stamp is required and may be purchased prior to the class with check or cash at the shop. Class size is limited to 4 and pre-payment is required. Please give us a call at 410-357-9557 or drop us a line at info@backwaterangler.com to register. This entry was posted in events on August 25, 2009 by Theaux Le Gardeur. Thanks to Bob Hammer for the picture from Slough Creek in Yellowstone National Park, the fishing report and the Winston BIIX rod review. I have been out west, breaking in my new Winston Boron IIx rod purchased at the shop. It has performed wonderfully. Thanks for your help. The biggest fish of the trip was this 20″ cutt caught on Slough Creek in Yellowstone National Park. I spotted it cruising along the bank away from me. By the time I got my fly off the keeper, I had lost sight of it. I saw it again after it turned around and came toward me. I flipped my elk hair caddis in the water. I thought too sort of the fish, but I held it in the water. Eventually, the fish came over and smacked it. Cutthroats have a reputation as poor fighters, but I found this misinformed. Just when I thought I had him whipped, he peeled off line toward the middle of the river. After about 10 minutes of this, I was finally able to get this picture. During the trip I fished the Popo Agie, Tongue, Clarks Fork of the Yellowstone, Slough Creek, Soda Butte Creek and Green River. I found the fishing generally good where ever I went. I didn’t experience blizzard hatches, as hoped, but the evenings usually produced a modest emergence of some kind. This entry was posted in fishing report, gear, reviews on August 25, 2009 by Theaux Le Gardeur. The emergence of the Sweetgrass Rod Company has spurred yet another round of interest in bamboo fly rods and each week we answer dozens of questions from folks who are starting to give bamboo a look. With the price of high quality graphite rods climbing higher and higher, a fine bamboo rod is no longer out of reach and to some they are starting to seem downright affordable. So with that I thought it would be useful to create a small primer for those looking to purchase their first bamboo rod. This will by no means be a complete “how-to” but it should point someone in the right direction when they begin searching out a bamboo rod. First and foremost, don’t believe the myths you’ve heard about bamboo fly rods. They are not all slow, whippy delicate sticks that break easily. Remember, once upon a time all fly rods were made of bamboo and quite a few of them are still being fished today. Bamboo, pound for pound, is stronger than steel and a well cared for rod can last several lifetimes. Learning a bit of bamboo rod history can be very useful. The so-called “golden age” of bamboo fly rods lasted from about 1920-1970 and the names of the well-known makers come up in nearly every conversation about bamboo rods. Just like today’s Winston, Sage and St. Croix, each maker had differing levels of style, quality, value and performance. Among the company’s and makers you will want to familiarize yourself with are Leonard, Payne, Dickerson, Young, Edwards, Granger and Heddon. Figure out what you want the rod to do. Are you looking for a “tuxedo” rod? That is, one you’ll pull out once or twice a year for a special outing or do you want something like a solid, dependable 8 ft. 5 wt. that you’ll use every time you go fishing? Bamboo fly rods come in as many lengths and line weights as graphite rods and are just as useful for a multitude of fishing tasks. Unlike a graphite rod, however, a skilled rod maker can custom tailor a bamboo rod to fit your particular casting or fishing style. I promise you, there is a bamboo rod out there that will suit your needs perfectly. Go out and cast some rods. One of the toughest things to come to terms with, at least in the beginning, is that there are so few bamboo rods available to cast. Here at Backwater Angler we always have a selection of both new and lightly used rods available for your inspection but in most fly shops this is the exception rather than the rule. In our area, the National Capitol Angling Show usually has at least one vendor with a few bamboo rods available to cast and purchase. A little farther from home, the Fly Fishing Show in Somerset, NJ attracts a number of today’s finest custom rod builders who will gladly take time to speak with you about their rods. They may not always have rods to sell but they will always have a few to cast. And they gladly take orders on the spot. Which brings me to another important point: get to know the guy who made or is making your rod. A few words about price; as John Geirach observed in his book Fishing Bamboo, a good bamboo rod has never been cheap. You will no doubt encounter rods selling anywhere from $700 on the low end to over $3,000 on the high end, with most rods priced in the $1,000-$2,000 range. That might sound expensive but if you weigh the price against the cost of labor (about 70 hours per rod, give or take), parts, materials and wear and tear on equipment the rod maker is only earning between $10-$25 per hour. And don’t always look at the price as the determining factor in picking out your fly rod, an expensive rod isn’t always great and an inexpensive rod can sometimes surprise you with its quality. I will strongly suggest that you avoid buying rods on eBay and any bamboo rod made in China. Finally, use the internet to your advantage. There are dozens and dozens of rod makers out there with highly detailed websites. Do some poking around and you will be amazed at just how many rodmakers you’ll find. This entry was posted in gear on August 19, 2009 by Bill Felter. 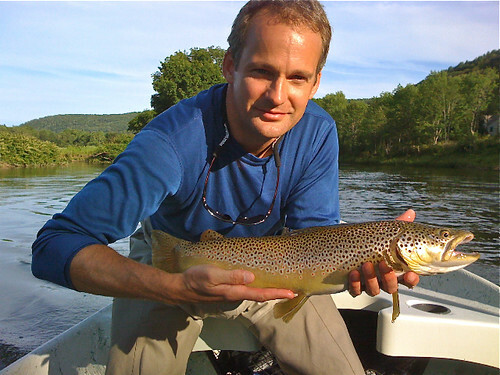 The fishing conditions on the Gunpowder are good for dry fly fishing. 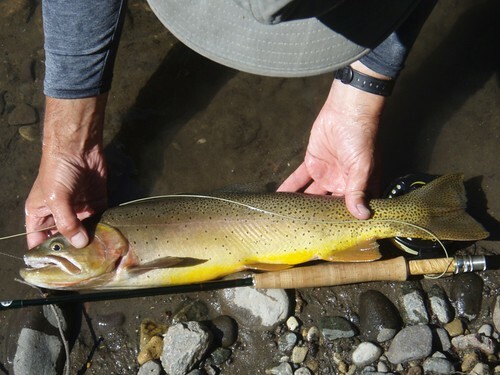 The fishing is certainly challenging, but between the morning Trico hatch and terrestrial fishing, trout are rising to a variety of patterns in weekday lower flows. On certain weekends releases may not occur if there is no need to send water to Loch Raven. The most important factor in low water conditions is not spooking the wary, wild Gunpowder trout, which is certainly easer said than done. Longer casts, 12-15 foot leaders, and staying out of the water where possible, will greatly improve the odds of catching trout. The shallow water and the heat makes for a warm day in waders, so consider wet wading. A pair of 2 mm neoprene Simms Guard socks in stock will keep your feet from going numb in the mid fifty degree water in the Upper river. These “spring creek” conditions present numerous sight fishing opportunities and a well placed first cast is all that is needed. The morning Tricos are luring a number of anglers to the river, although many head home just after Noon when the hatch ends. Most access points are quiet and even boat traffic is limited or non existent upstream of York Rd, due to the shallow water. On two days this week I fished the Trico hatch, and stayed from 1-4 pm fishing a foam “Gunpowder” beetle on a 14 foot 6x leader. On both days the number of fish caught on the beetle exceeded fish caught on Tricos, and added up to a lot of trout with the combined morning catch. Terrestrials are always fun to fish, but spotting trout, making the cast and watching the take in crystal clear water adds a whole new element. For the late risers, haters of 7x, and tiny flies, consider fishing beetles, the shop has a wide variety of patterns. This video post features wild browns with big appetites for foam and rubber legged beetle patterns. This entry was posted in fishing report, video on August 14, 2009 by Jason du Pont.